Italy is such a seductive place for the traveller. 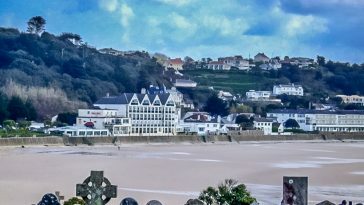 I don’t think that there is is another country that has so much beauty and difference in such a relatively small area. Be it the rolling hills of Tuscany, the dramatic Amalfi coast, the stunning great lakes of the North, the historic towns and cities, the food, the wine, or the beautiful people. La dolce vita. 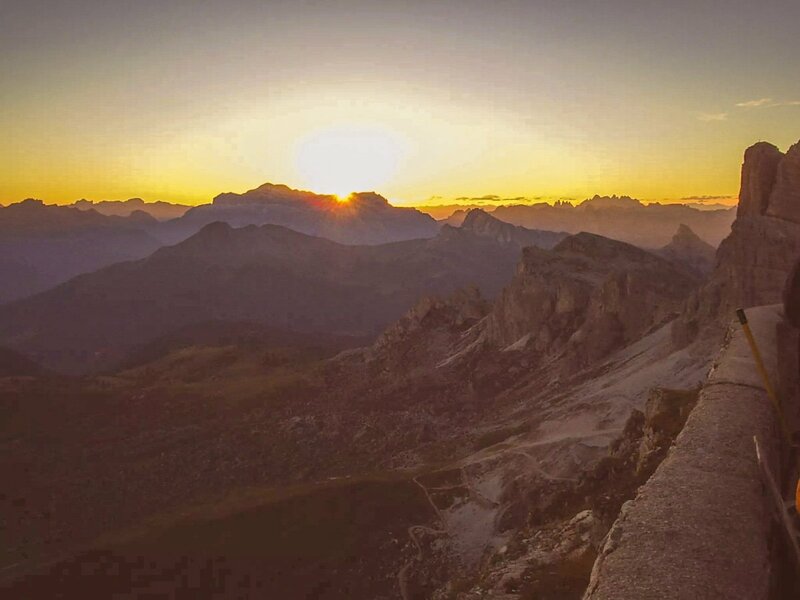 There is so much to enjoy in Italy and for walkers it even has the most beautiful mountains. 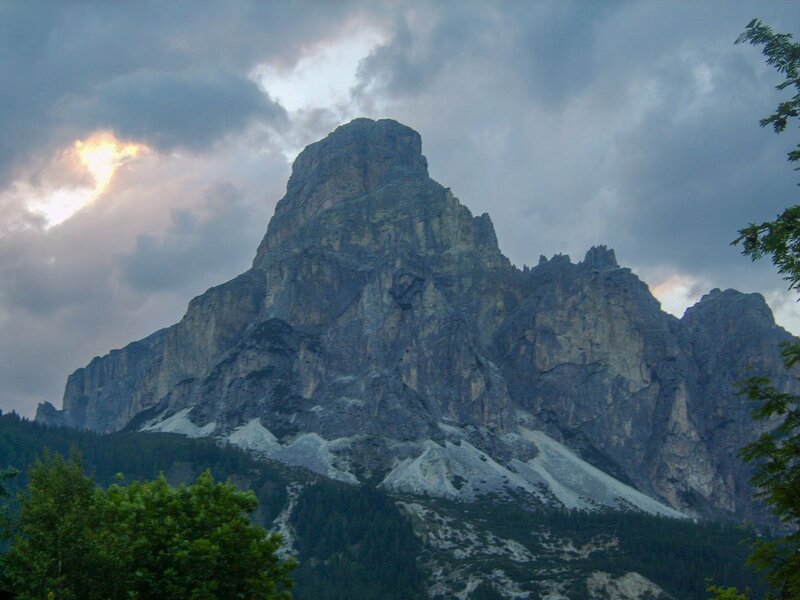 The Dolomites are dramatic, spectacular, colourful, and should be on any hiker’s to do list, or if you have already been, then they should be on your to do again list. 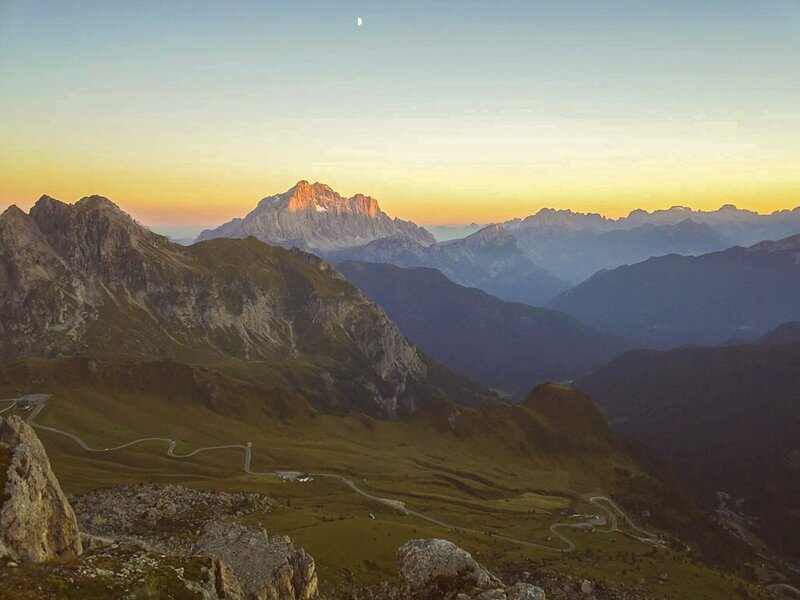 The Dolomites form part of the eastern part of the Alps and are situated in north eastern Italy between the provinces or Belluno, Trentino, and the South Tyrol, the northern part of which extends into Austria. The area has changed hands over the years and there are both Italian and Austrian influences to be found in the picturesque villages, as well as a third ingredient; that of the indigenous Ladin people who have their own language, traditions, fairytales, and traditional dress, which adds another layer of interest for visitors coming to this corner of Italy. There is so much here for walkers and outdoor enthusiasts. 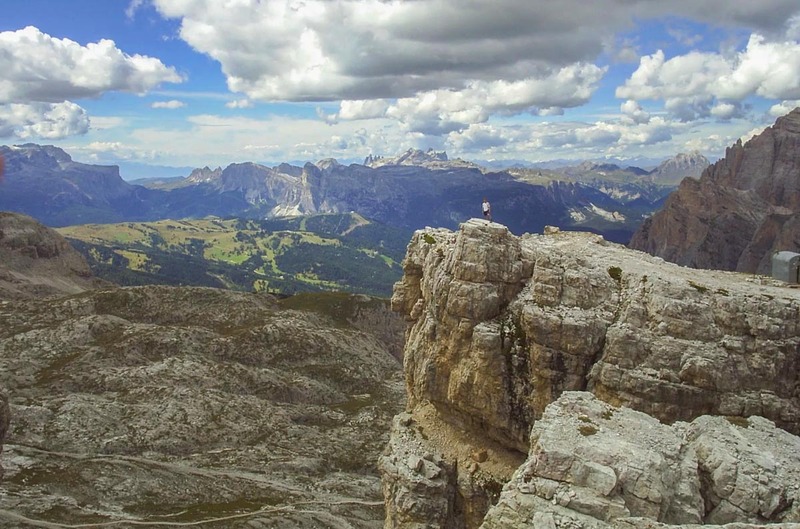 The Dolomites are famous for their network of via ferrata, which were originally constructed to move soldiers around during the first world war, and gives adventurous hikers access to ascents that are normally only the preserve of climbers. 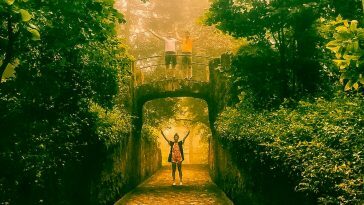 In addition, there is mountain biking, paragliding, rock climbing, as well as more gentle pursuits, but it was the walking that I came to experience on my last visit here. 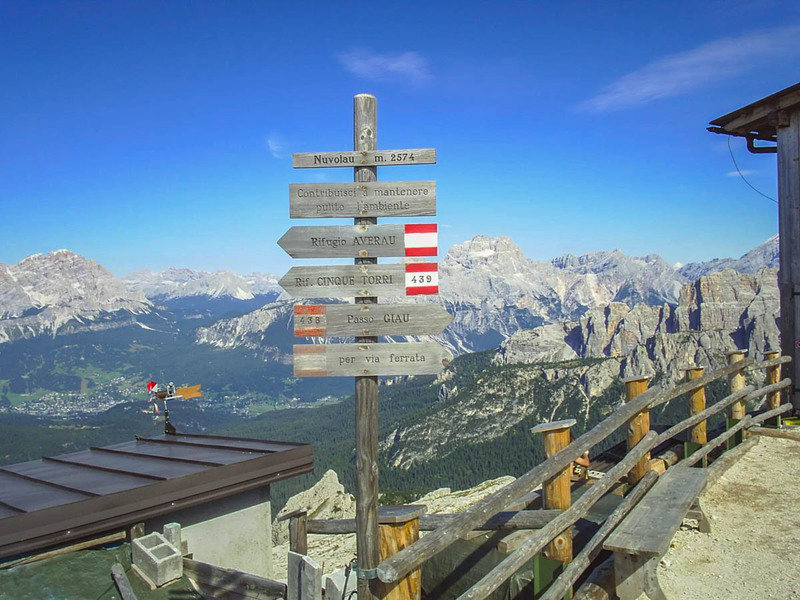 There are several natural parks in the area; Puez – Odle, Fanes Senes Braies, Dolomiti D’Ampezzo, and we spent most of our walking time exploring these, including some rifugio to rifugio treks with overnight stops high up in the mountains which I’d highly recommend. Our first walk started at Passo Pordoi and a ski lift which whisked us up 700 meters of potential hard slog to our starting point, at 2900m on the magnificent Sella massif. 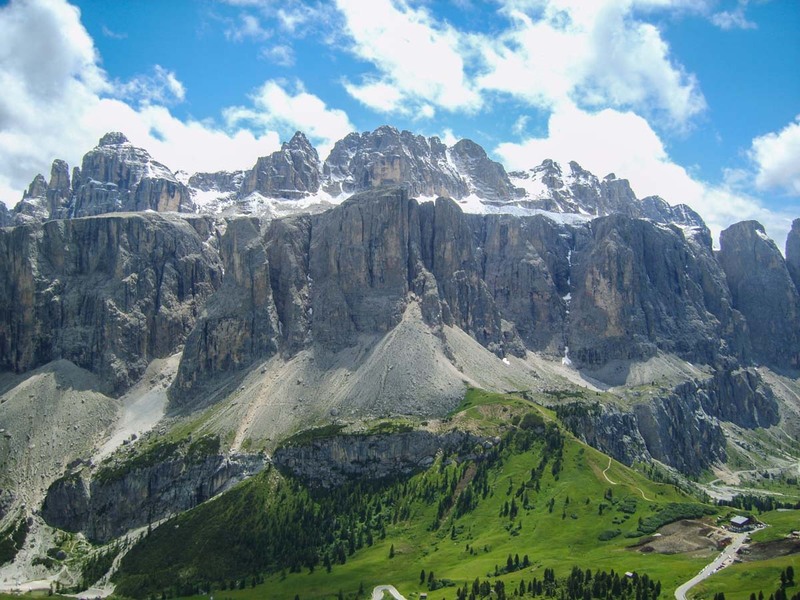 From a distance the Sella looks like a huge multi-layered cake; gentle green slopes set the base, above this are steeper ascents with rocky ravines, then a layer of magnificent sheer limestone cliffs, and finally some fabulous peaks are the cherries on top. In this case the cherry was the peak of Piz Boe which was going to be a simple stroll to 3152m and our high point for the day. 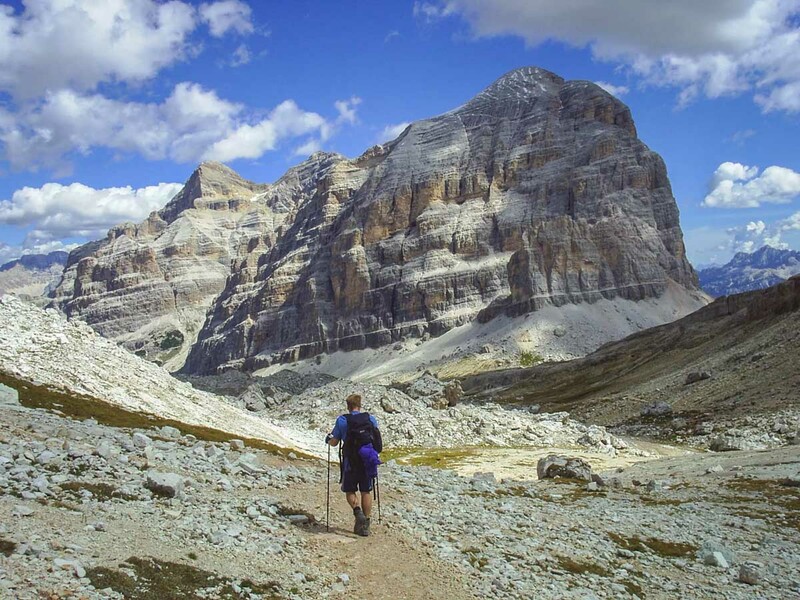 The ski season is huge here and attracts significantly more tourists than the summer season, but for summer hiking, the ski lifts are mainly open through the peak summer months and allow access to, and more importantly back from, some fabulous high level routes. Shortly after descending from the Piz Boe peak we came across the second gift that the skiing network gives; mountain huts and rifugios that have restaurants with great food, and if you don’t have to negotiate a tricky descent, beer and wine as well as some fabulous views to feast your eyes on as you enjoy a cold beer. This was a relatively easy first day stroll with only a few hundred meters of ascent and allowed us to find our feet and take in the views down to Val di Fassa and over to the majestic Marmolada, the highest peak in the area with its huge glacier on its north facing side. After leaving the rocky peak of Piz Boe, which still had a few spots of snow after some late summer storms, we dropped down through some scree filled ravines, and then down through lush fields and meadows before arriving back at our hotel in the pretty little village of Arabba. As well as Arabba, we stayed in the village of Corvarra which is a fabulous base with plenty of hotels, restaurants, and amenities, was well as a night in more affluent Cortina D’Ampezzo which is more Bulgari than Berghaus with it’s well to do shops. The highlight of our walking trip was a four day trek that took in three nights at some of the marvellous rifugios that can be found throughout the area, as well as some amazing high and low level paths through wild mountain country. 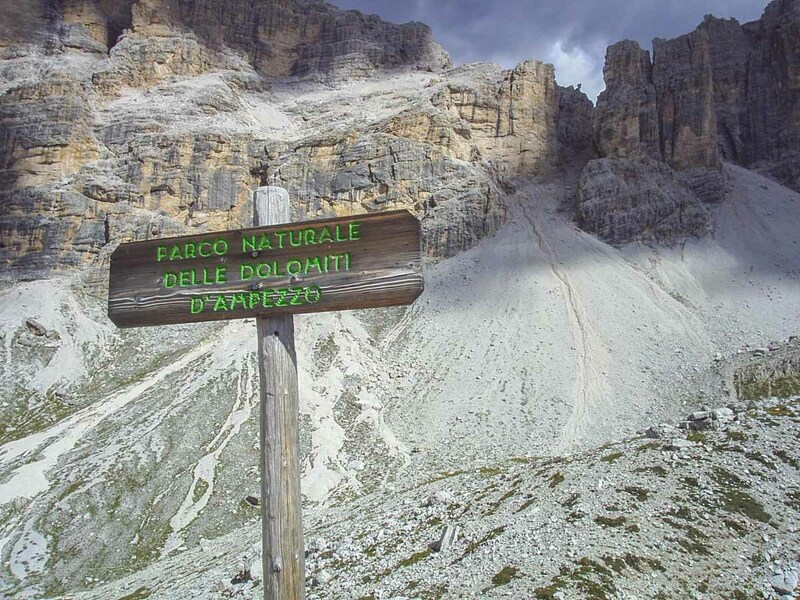 There are two famous trails that run through the Dolomites; the Alta Via 1, and Alta Via 2. The two routes run north to south (depending on which way you are travelling) and are almost parallel, and each would take 2-3 weeks to complete if taking them in their entirety. They are both fine routes that take in the best paths, views, and terrain that the area has to offer and our trek took us through some of the Alta Via 1. 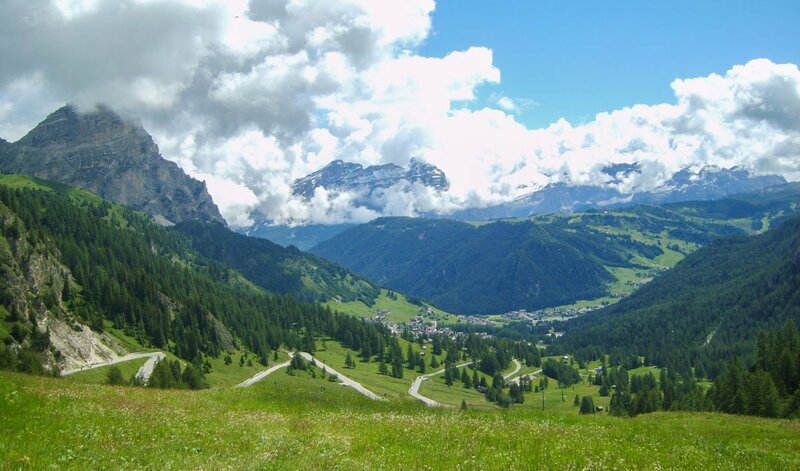 Our route started at Passo Falzarego and we set off on path 441 in the direction of Nuvolau. The signposting and path numbering system might seem odd to people used to walking in the UK, but I liked it and it was always reassuring to see the red and white paint on a rock with our number on it to tell us we were still going in the right direction. After a few hours of walking through great paths on a baking hot early September day, we came to the foot of Nuvolau, before a final 30 minute yomp up to fabulous mountain hut perched on the top. The rifugios are relatively cheap but need to be booked in advance – the next nearest one will usually be three hours away if they are full! They usually serve big plates of tasty food and provide breakfast the next morning. Packed lunches are usually also available. Rooms are typically dorms with bunk beds but some do have smaller rooms. However, the main benefit of staying in them, as we found in our night at Nuvolau, is that spending a night in the mountains is often a magical thing. We were treated to a magnificent sunset show which was so beautiful that even the staff were coming out to take photos. 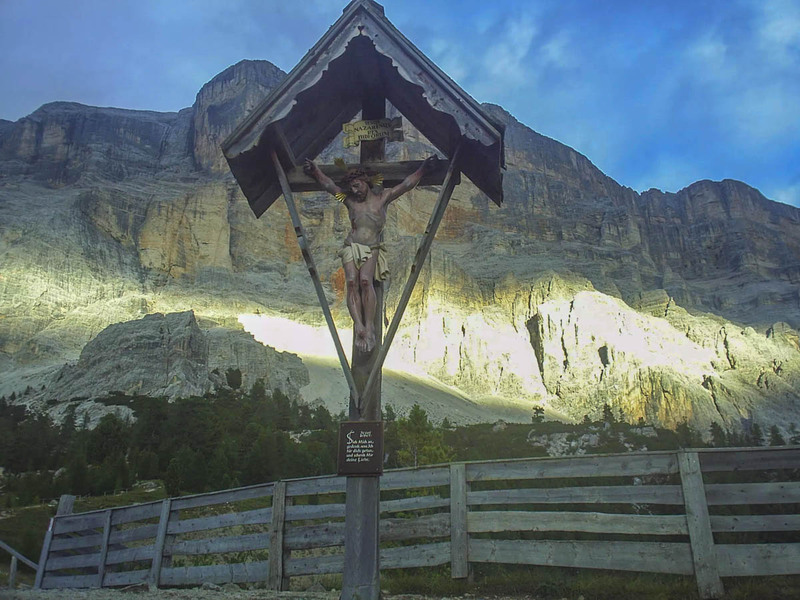 The rest of our walk took us through the first world war tunnels at Lagazuoi and some high level paths in the Dolomiti D’Ampezzo Natural Park, before dropping down for a night at the picturesque Rifugio Scotoni. The following day was a challenging hike up to the peak of Lavarella at 3055m before a long descent down to the beautiful Rifugio Santa Croce. After a very long and hard day this was a very welcome stop and the food and wine were particularly well received. 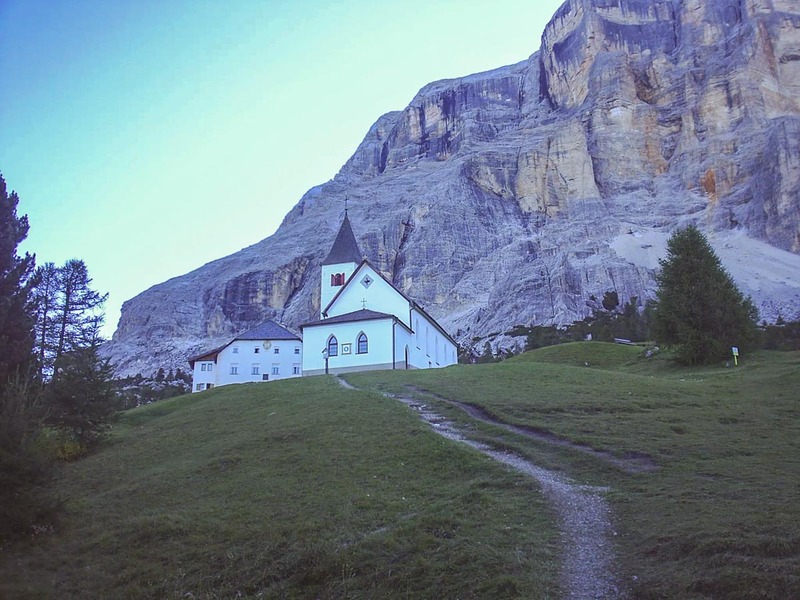 Santa Croce or ‘La Crusc’ as it’s also known, is a magical place set on the edge of the Fanes Senes Braies Natural Park and at the at the foot of the west facing Sas Dla Crusc limestone cliffs. The church next door adds an air or spirituality to a stay there but it’s the ‘enrosadira’ which makes it look heavenly. The enrosadira is the name given to the phenomena by which the walls and peaks of the Dolomites turn pink and red at sunset and sunrise, and the western facing walls at Santa Croce are the perfect canvas for this light show. The final leg of our walk involved a chair lift down from Santa Croce to the village of Pedraces followed by a gentle day exploring the lovely and lush Val Badia before heading back to civilisation and a hotel in Corvara. 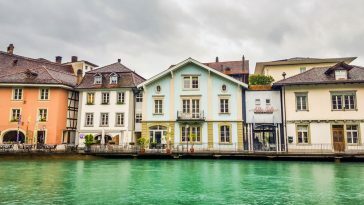 There is so much exploring to do in this area and you could spend a lifetime holidaying in the Dolomites and still feel like you have only scratched the surface. It’s an accessible place, only a few hours drive from Venice, Treviso, Verona or Innsbruck to the North. 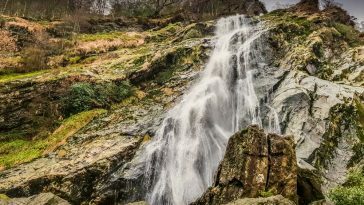 There are lots of great books and blogs which will give you plenty of detail on the walks and especially the two Alta Via routes, and accommodation is plentiful and easily sourced. 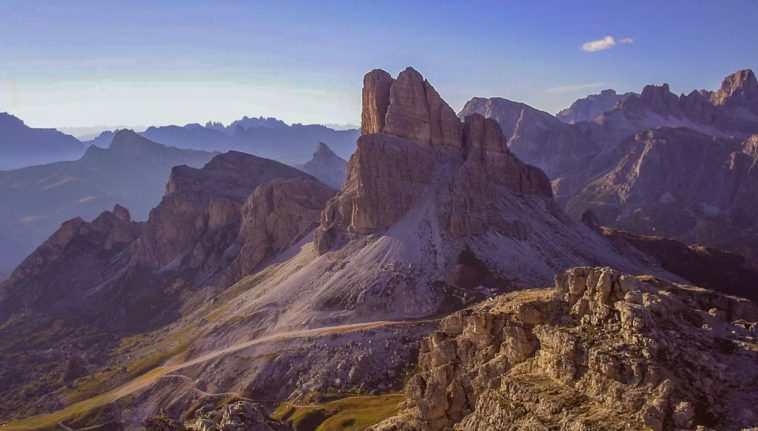 Italy has so many beautiful places to visit, and there are so many magical mountain ranges to visit across Europe and the world, but if any of these places are as beautiful as the Dolomites then I’ve not been there yet. Go and enjoy them.